Google has unwrapped the first complete prototype of its self-driving car project just before the holidays, showing off a fully functional autonomous driving vehicle that is now ready to be road tested. "We've been working on different prototypes-of-prototypes, each designed to test different systems of a self-driving car—for example, the typical car parts like steering and braking, as well as the self-driving parts like the computer and sensors," Google said, reports Business Insider. "We've now put all those systems together in this fully functional vehicle—our first complete prototype for fully autonomous driving." The project was first shown as a mockup back in May. That was only an early design concept with the vehicle missing headlights, a steering wheel, brakes or accelerator pedals. As you can see from the photos, the final prototype actually looks very similar to the early concept, a bubble-like car resembling a compacted VW Beetle. The prototype unveiled this week now has headlights, temporary steering wheel and pedal systems, in response to new California DMV rules, in addition to reflector dots added to the front grill. "Our safety drivers will continue to oversee the vehicle for a while longer, using temporary manual controls as needed while we continue to test and learn," Google noted. The hardware sitting on top of the car, which provides the car its vision, has been compacted into a car siren-shaped dome, as you can see below. Even though its development is looking positive, there is unfortunately still no indication from Google as to when these autonomous vehicles will actually hit the roads. "We're going to be spending the holidays zipping around our test track, and we hope to see you on the streets of Northern California in the new year," the team said. 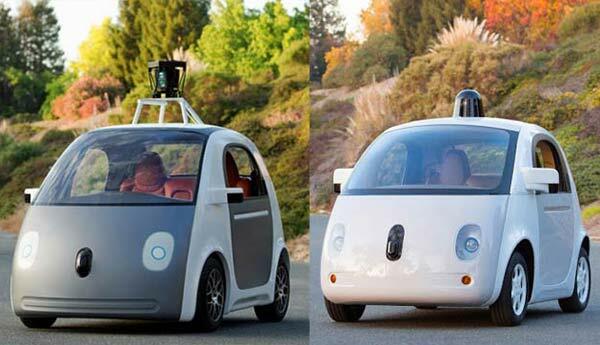 Google has already received permits, from the state of California back in September, to begin testing its self-driving cars on public roads. I wonder how “temporary” the steering wheel and pedals actually are. As long as they are there, the driver is legally responsible for the vehicle, but without them? IIRC, you can be prosecuted for being drunk in charge of a vehicle even if the vehicle is parked and you are asleep in the back - if you have the ignition key. I'm well aware of that, hence my question :) Are you in charge of the vehicle or are google?